Gosh, its three weeks since I posted my last blog already. How time flies! Being a gardener and grower this time of year is pretty full on. 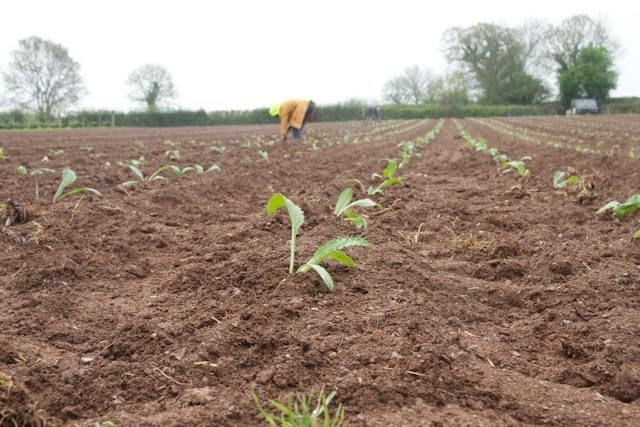 I have lots of clients I work for on a weekly basis as well as preparing my field where I grow flowers and am also busy propagating plants to go in it. So life is hectic and I am slightly overwhelmed by the impending season. But it is also a very exciting time of year in the garden with the first signs of growth and plenty of plants in flower. In this blog I am going to give you all a reminder and do a final push on our boxes to grow. I will suggest some general gardening tasks and wax lyrical about spring flowering plants. April is nearly here and deliveries of our vegetable and herb boxes to grow will be going out imminently, cut flower kits a bit later. It’s not too late to order one as we have a few left. I don’t want to bang on too much about it but these kits are great value and a fabulous way to kick start your gardens in one fail swoop. No decisions on what to grow or where to get it all from. 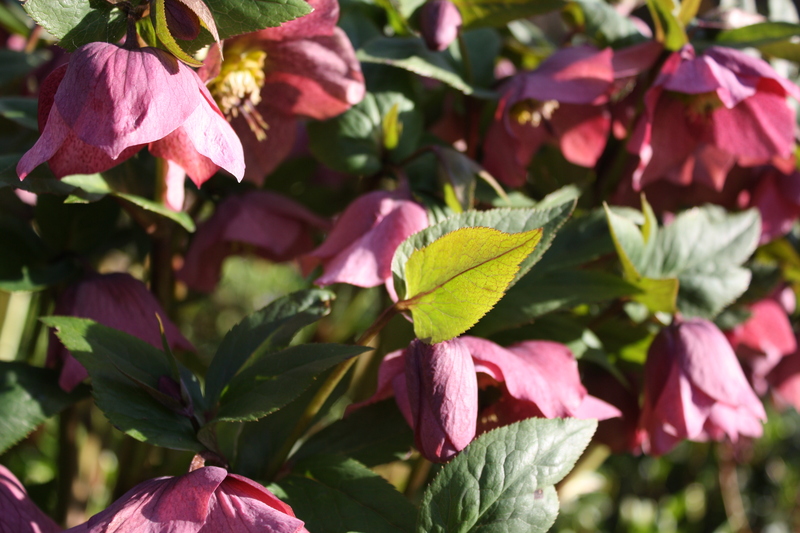 We have used our experts to select good tried and tested varieties to give you the best chance of success and comprehensive advice on how to plant and grow these are also included in the boxes. 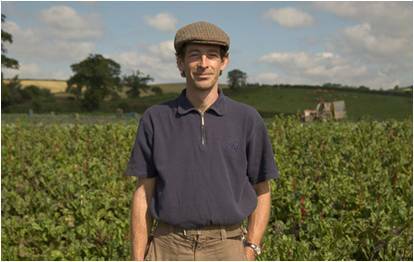 I will also be supporting you with my gardening blogs and here to answer your queries. If you have already ordered one remember to do the recommended site preparation we have on our website. I have taken some photos of some plants I love that are flowering now. Its good practice to keep your eyes open when out and about and observe good companion plantings around you and maybe think of incorporating these into your garden spaces to improve what you already have. 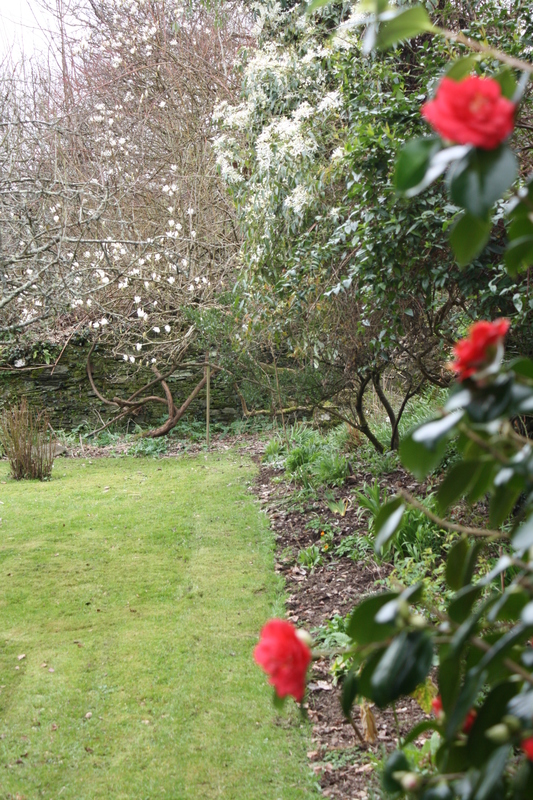 In the foreground a red Camelia, clematis armandii climbing through a tree and in the background a magnolia tree. 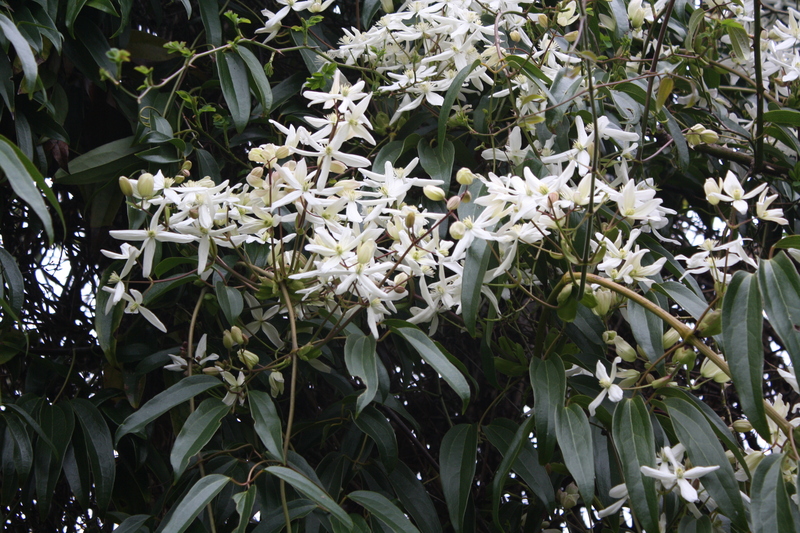 A close up of Clematis armandii. You can grow this evergreen climber up a wall,trellis,fence or through a tree. 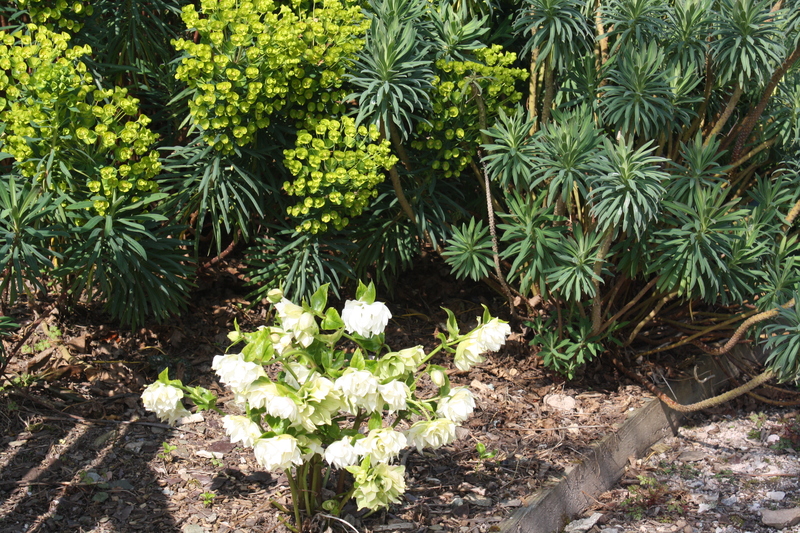 It has lovely glossy foliage its quite happy planted in more shady positions. Hellebores are an absolute favorite of mine. 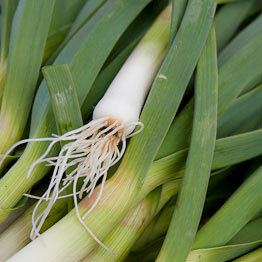 Once big enough they can be split after flowering and replanted to increase your stock. I have done this in this little woodland area over the years and it really looks a picture at this time of year with the under planted periwinkle and primroses in flower too. 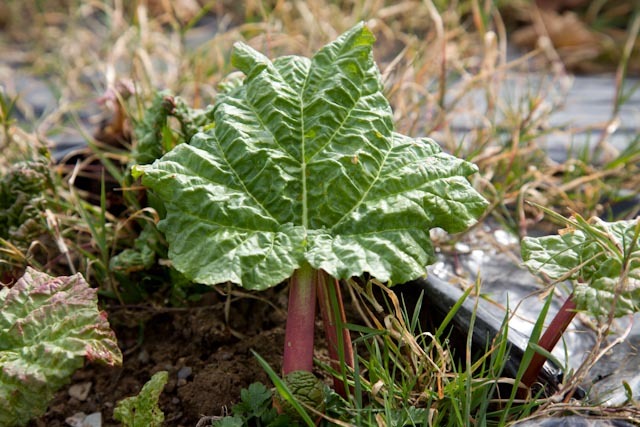 WEEDING This is the time of year to have a jolly good ‘spring clean’ in your gardens. Perennial plants are just beginning to grow again. 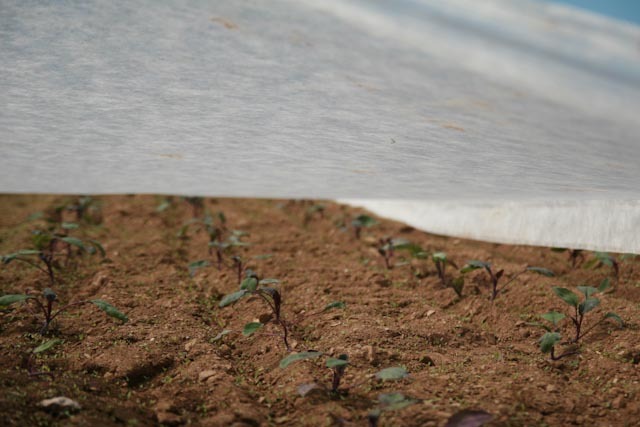 Before things get too tall its an ideal time to really get in there and give your beds a jolly good weed. I have problems in a fair few gardens with perennial weed such as bind weed, couch grass and ground elder. 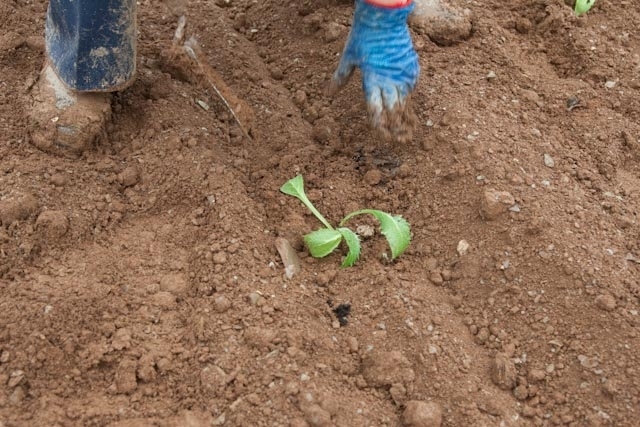 Gardening organically I would not use weed killers as they are detrimental to the wildlife in our gardens and leave nasty deposits in the soil too. Keeping these nasty weeds at bay is the answer. 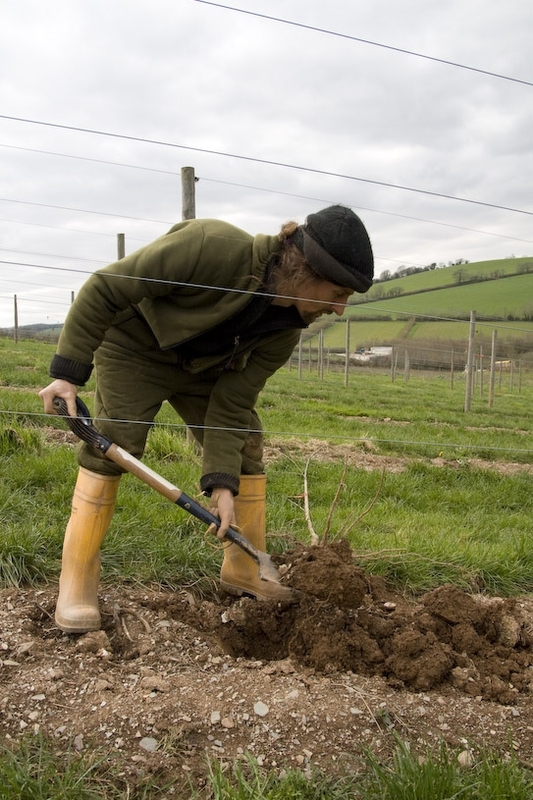 If you’re feeling thorough, this might mean digging up a perennial clump and teasing the roots of the said weed out and replanting the clump. 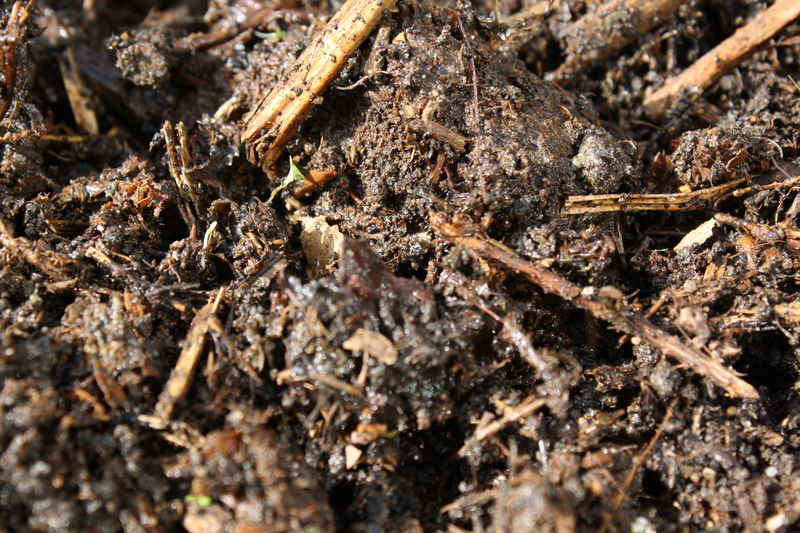 Remember…DO NOT put these weeds in your compost heaps. 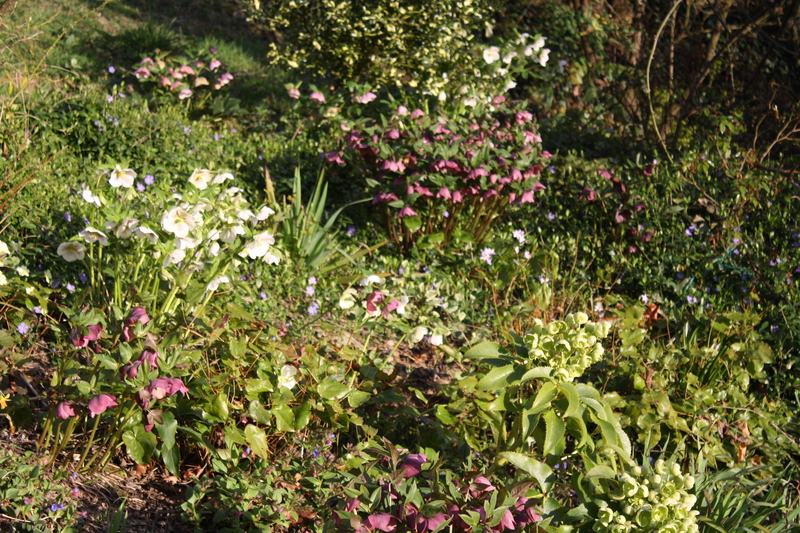 DIVIDING up over crowded perennial clumps can be done now. 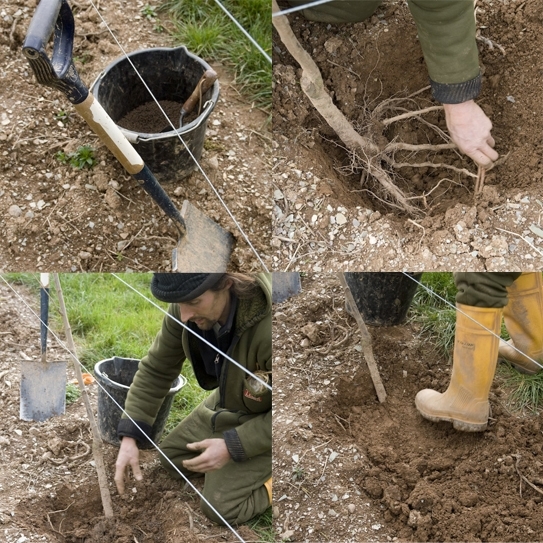 Dig out the clump and put a sharp spade blade through the centre of the clump to cut it in half or more if necessary. COMPOST I have a rather tired body, being rather ancient doesn’t help and nor does the kind of work I have been doing the last few weeks emptying a fair few compost heaps in various gardens in the area. It is quite satisfying though to see what you have produced from simply garden waste. This is great stuff to spread on to your beds, around the plants and lightly fork in. 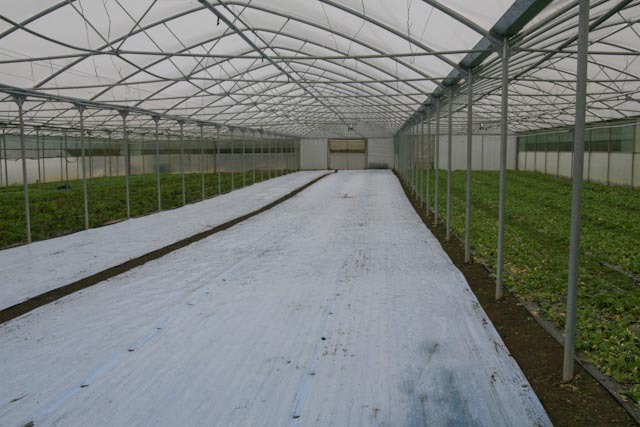 It will improve the soil and act as a mulch helping the soil to retain moisture. 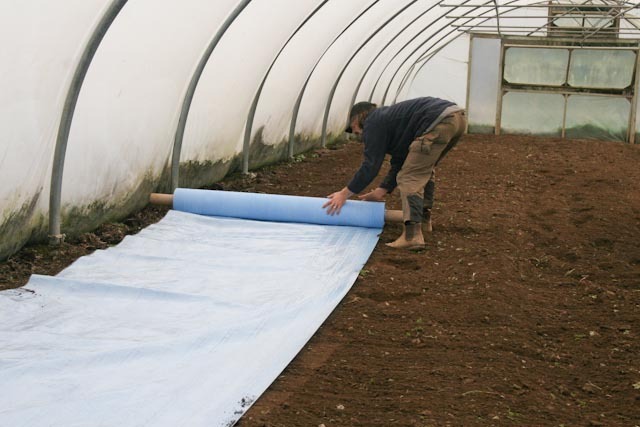 As a lot of us are already being threatened with hose pipe bans this is pretty essential. As my seedlings are not ready for transplanting yet I will leave this till next time possibly with a video clip…heres hoping! 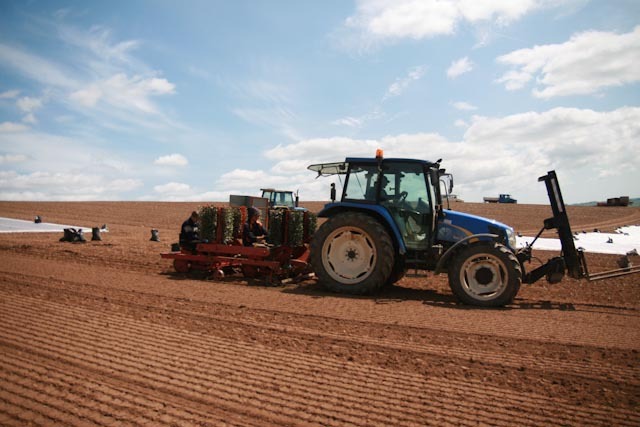 Taking advantage of a nice, sunny day, we decided to go o ut to the fields on our farm in Devon to see the kohlrabi being planted. 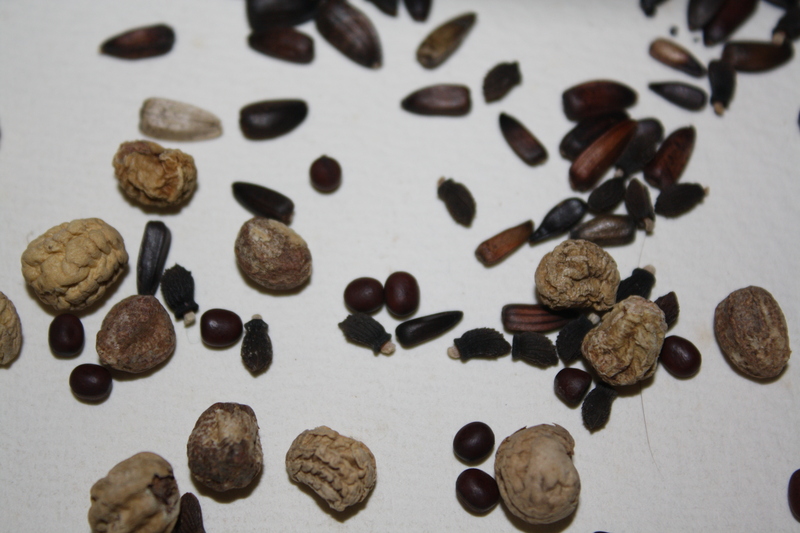 These were raised in a nursery and come to us in modules. 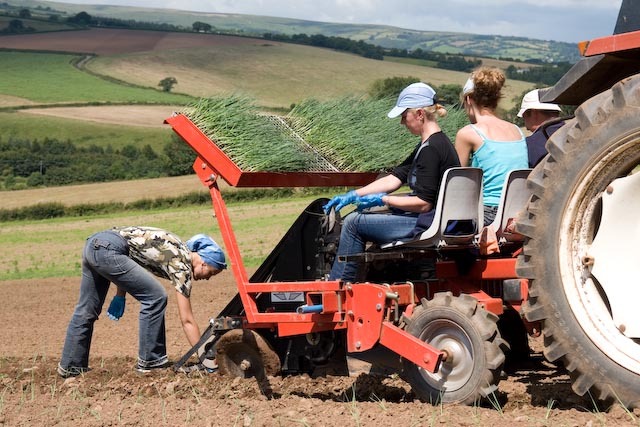 Our field workers sit on a planter which is pulled along behind a tractor and drop the plants into moving cups which puts them into the ground. 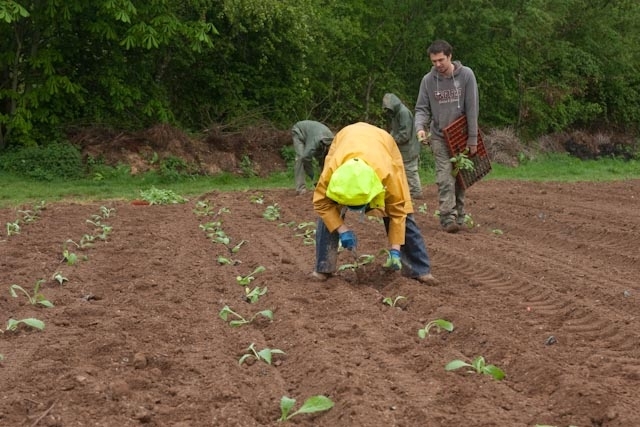 Once they’re bigger, we will use a steerage hoe to get rid of the weeds and if the weather is too dry, they will be irrigated. 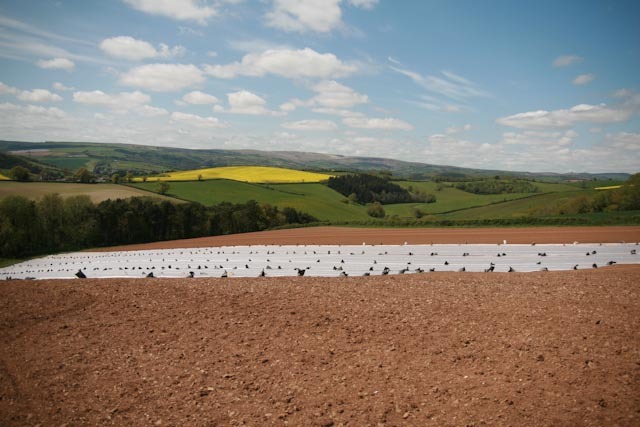 These were planted in mid May and are likely to be harvested around mid July. 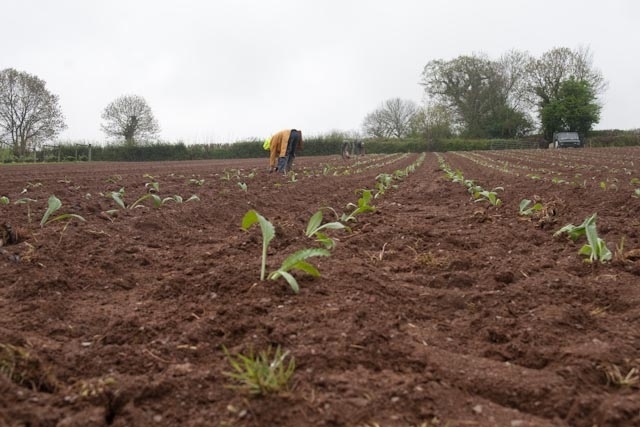 On a wet and grey Thursday in early May, we took a look out on the fields behind the Field Kitchen at our farm in Devon to see the globe artichokes being planted. 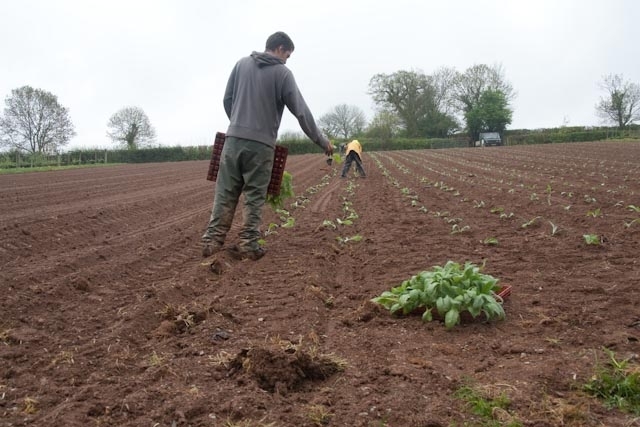 The rain is ideal for them, but not so great for the guys in the fields! 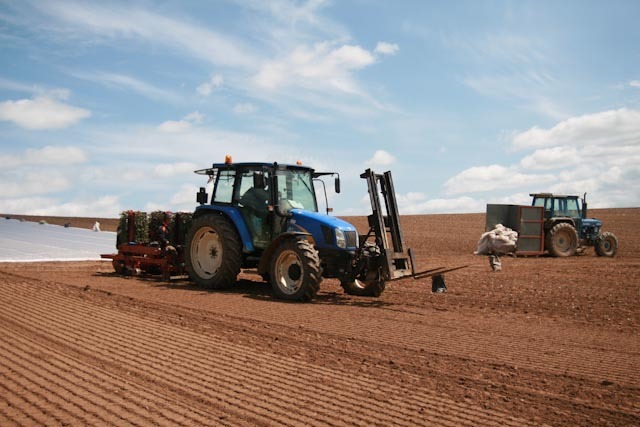 The wet ground means we can’t plant them by machine, but it also means they should get off to a great start and we will be picking them around August to October. 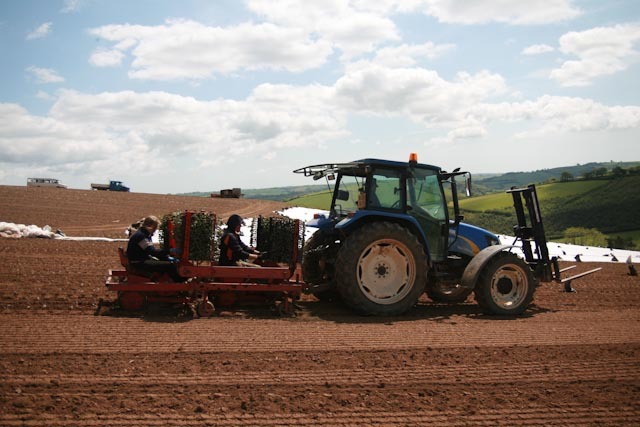 Raphael and John (who’ve been at Riverford for over 5 years) have been planting Victoria plum trees on our Devon farm this week – over 720 of them. This year they’ll look beautiful as they flower and next year the fruit will come. We’ll just have to be patient! They’ve planted the trees at a 30 degree angle and attached them to wires running horizontally. 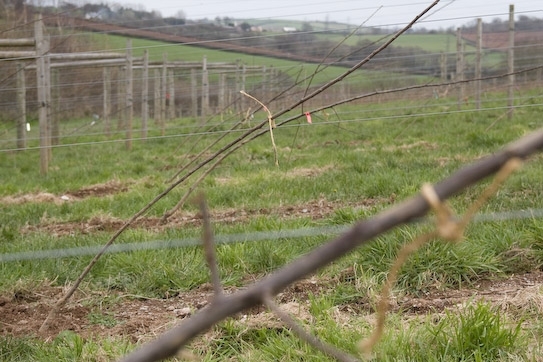 You can see the trees are in open space to let the wind blow through rather than blowing them over and that lovely organic fertiliser (mainly chicken poo) will help get them going in the early days. The tiny leek seedlings we are out planting now will mean many tasty soups and stir-fries for you over the autumn and winter months ahead.